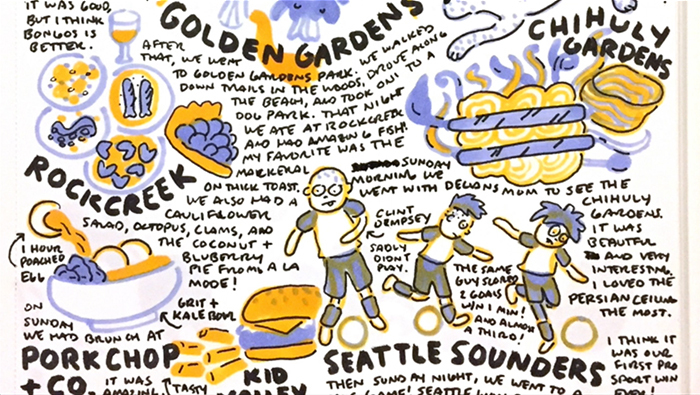 While living in Seattle for the summer, I’ve been documenting my stay in this lovely city on Instagram through the hashtag, #MightCouldInSeattle. 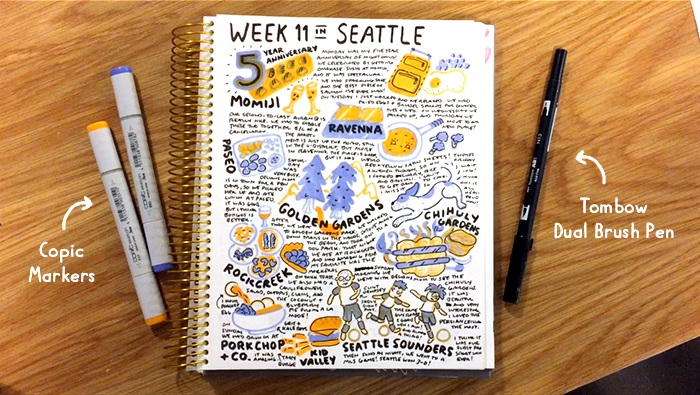 I love looking back each week at all the things I did, and I intend to continue this practice of weekly journaling/sketchbooking in the future, even once I’m back in Atlanta. I try to draw the weekly review in my sketchbook each Sunday afternoon because Sunday evenings are a nice and usually chill time to relax, unwind, and review the week as it ends. Thinking back through the week helps remind me of everything I did, everyone I interacted with, everything I accomplished, and gives me a general positive vibe of gratitude to start the next week and take full advantage of it! 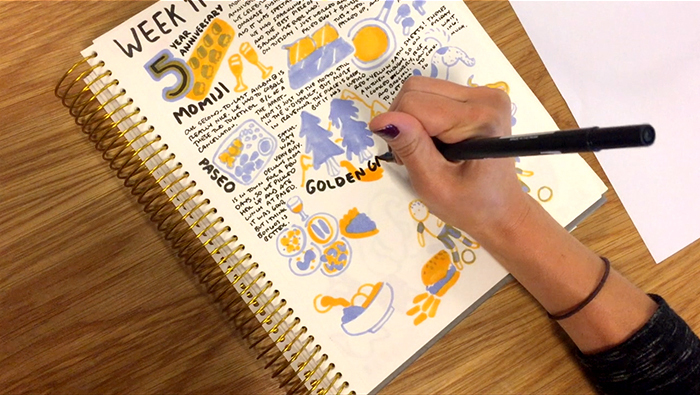 Many of you following the series have asked me how I make these pages, so I thought I would go through a short tutorial with you here, showing my full process for the weekly review sketchbook pages. You can watch the video tutorial below, and then get more details in the written tutorial following! Let’s go! 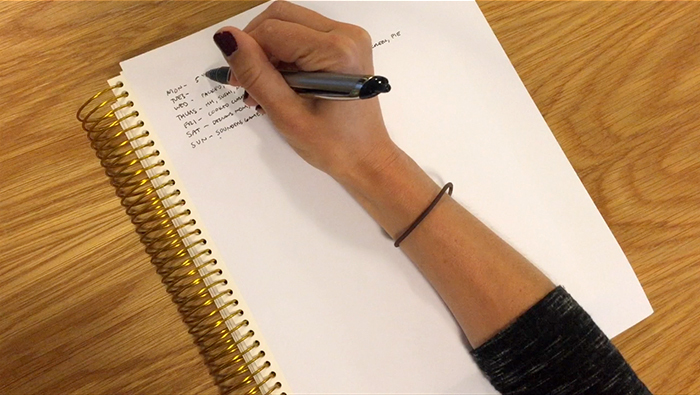 Step 1: Write down a list of all the things you did. 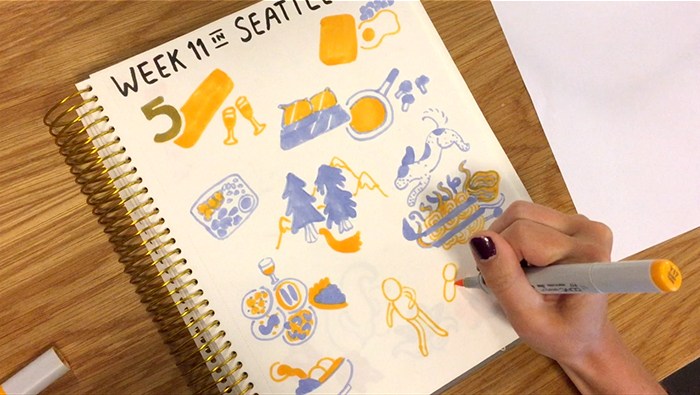 Before you begin drawing, you’ll need to have an idea of what all you want to fit on the page. I like to do this by writing out a quick list of the things I did each day on a scrap piece of paper. 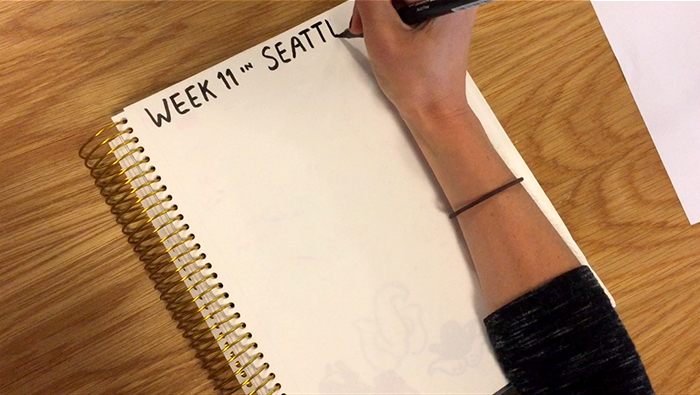 First, I write down each day of the week, with some space to the right of each day. Then starting with today I write down the major things that happened! Sometimes I have a lapse of memory and completely forget what I did one day. When that happens, I look back at photos on my phone, my calendar, or ask Declan if he remembers what happened that day. It’s actually a good thing when this happens, because I end up remembering things I would have otherwise forgotten! But sometimes I forget a day because I just didn’t do anything all that interesting that day. Oh well, there’s always something to be mined for a drawing, even when you’re not living it up. You may need to do some culling here if you do a lot each week. Pick and choose what you want to draw — you don’t have to draw every single thing! What do you want to remember about this week the most? What impacted you the most? What would be fun to draw? What would be challenging to draw? Draw that! Step 2: Choose your colors. Once I finish my list, I push it off to the side and crack open my sketchbook. I know what I’m going to be drawing now, so I can start to think about color palette! I like to stick to 2 colors + black for these drawings, but that’s a stylistic preference, and is totally up to the artist — you! — to choose. You do what you like best! When considering what colors to use, I kind of think about what I’m going to be drawing — Is it going to be a lot of nature? A lot of food? A lot of buildings? — but I also just go with my gut when choosing colors, and don’t spend too long making the decision. Since this is a series, I’m also aiming to not repeat certain colors too much, aiming to get a good variety of palettes from page to page. So I try to pick a new color combo for each entry. Step 3: Letter your title. Next, I draw out my title at the top of the page. 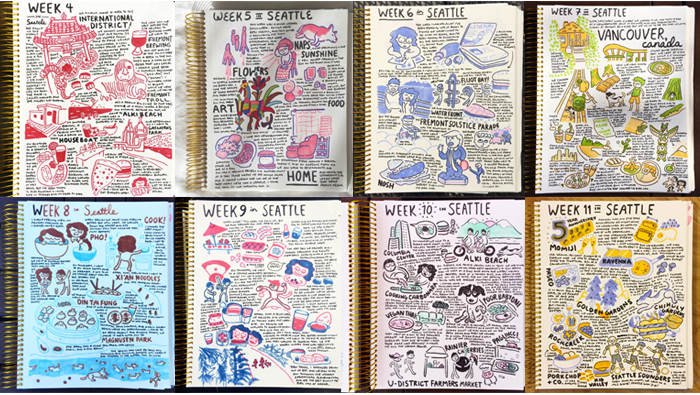 For this series, I decided each page would have a label at the top in big letters, numbering the weeks I’ve been in Seattle. This title and title style will be different for you depending on your style and what you’re drawing! In the beginning, I tried out a few different ways of lettering the title until I landed on something I liked, and then I stuck with that from then on. So don’t feel like you’re chained to what you do on the first illustration — you’re free to switch it up whenever you like! It’s a good idea to draw the label first though, to be sure you have room for it on the page. We don’t draw with pencils first here at Might Could! …so sometimes I run out of room. Eek. But drawing the title first solves that problem! Step 4: Draw your illustrations. And now FINALLY, it’s time to draw! 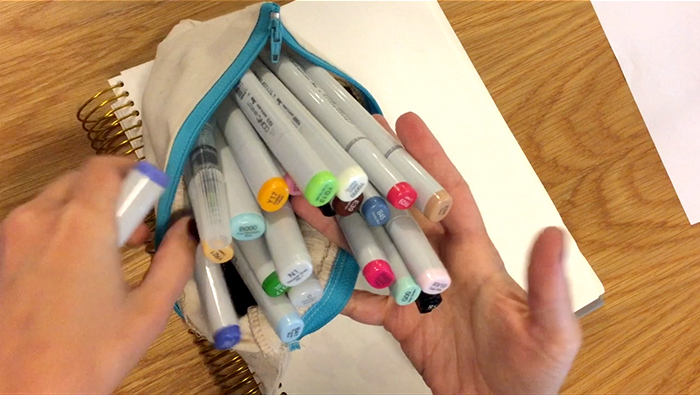 I grab one of my copic markers, and just dive right in! I don’t plan out the composition before — I like it better when I freewheel it. I use my list of events from before to guide me, trying to draw things in order of how they happened during the week. I aim to fill up the page, while still leaving plenty of white space between the drawings so I can write about what happened in between. It took me a few pages to get the feel of how to space out the illustrations, and it will come to you as you practice too. It helps me to think of it as fitting the text to the illustrations, rather than fitting the illustrations to the text. I also try to balance using the two colors plus black and white throughout the composition as I go. This helps keep it interesting and guide the viewer’s eye down the page. Step 5: Ink your linework + write your text. After I’m done drawing with the color markers, I can get to it with ink! With the paper and pen I’m using here — which is a generic unbranded sketchbook and Tombow Dual Brush Pens) the ink takes a long time to dry, and will smudge and get on my wrists if I’m not careful. So that means I have to draw the linework at the same time I write the text, unless I want to wait around for 2 hours while it dries. Ain’t nobody got time for that! So I start out writing the text in the top left hand corner, because I’m right handed. Then I write down what I did, trying to space it out so I stay on par with the illustrations, kind of tying the two together. I don’t plan out what I’m going to write ahead of time, because the illustrations and whitespace dictate how much I can say. Sometimes I have to say less than I want to because of the space available, and sometimes I have to add a little fluff to fill the space. 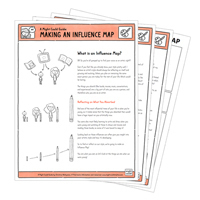 Labels are a great space filler that still add interest and facts! Remember, this is all for fun, so don’t stress about getting it perfect. Sometimes as I’m writing, I’ll add linework to the illustrations if they seem to want it. It mainly depends on the color palette and how the drawings are feeling as to whether I include linework or not. It’s totally an intuition call, and yours to make. Experiment with different things on each page! And that’s it! Take a photo of your work, slap on a hashtag, and share that baby with the world! Keep it going and make it a series! It’s a great motivator to draw continuously and start each week on a fresh and positive foot. I hope you enjoyed this short tutorial and decide to start your own weekly review sketchbook series! I really feel it makes me more mindful and grateful for all the things I get to do and the life I’m lucky to have. Each day has something special to remember, even if it was just a nice, fried egg.